Beneden staat algemene informatie over de PlasmaSensOut. Deze THC werkt ook zeer goed met EdingCNC. We hebben daar ook veel ervaring mee. - Met EdingCNC en MACH3/4 kan de machine aangestuurd worden. PlasmaSensOut is an universal torch height controller (THC) for precise plasma cutting. 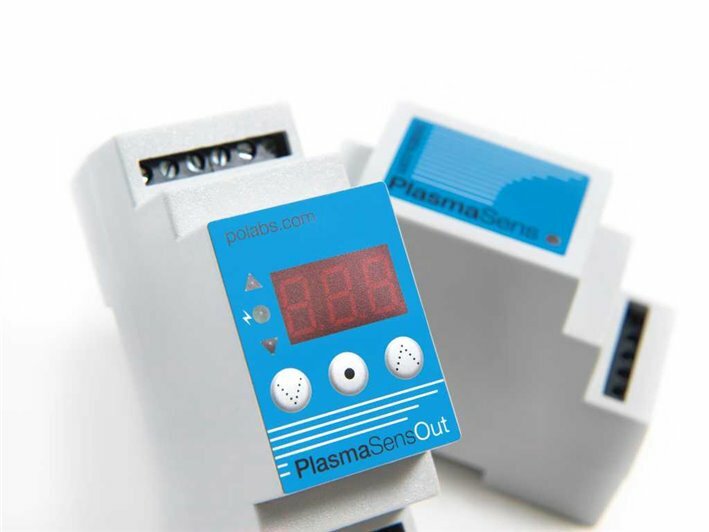 Thanks to optical fiber connection, PlasmaSensOut and PlasmaSens torch height sensor (including in a package) forms a complete and reliable torch height controller. Thanks to an optical connection it’s fully electrically (galvanic) isolated from high voltage plasma cutter’s equipment and also safe to use. PlasmaSensOut has standard programmable ARC_OK, UP and DOWN signals. Generally it is compatible with most CNC controller boards on the market. User interface is simple and user friendly. On the left there are 3 LED diodes to signalize state of the outputs. Next on the right side is also LED display. It has great readability also in high luminosity environment. In default state it shows temporally arc voltage. However menus appears on LED display during settings. Under LED display there are 3 buttons. Hence they allows quick and efficient moving through menu. User can set the following THC parameters: reference voltage, hysteresis (non-active range around reference height), delay time and anti-dive limit voltage. Moreover all parameters are adjustable during operation. It doesn’t need any drivers or special software. Even more, it is compatible with most CNC software and hardware which accepts OK, Up and Down signals. Compared to other solutions, PlasmaSens products are only solution with optical fiber isolation between sensor and controlling electronics. Even more, it is first and only PlasmaSensor with optical fiber isolation.